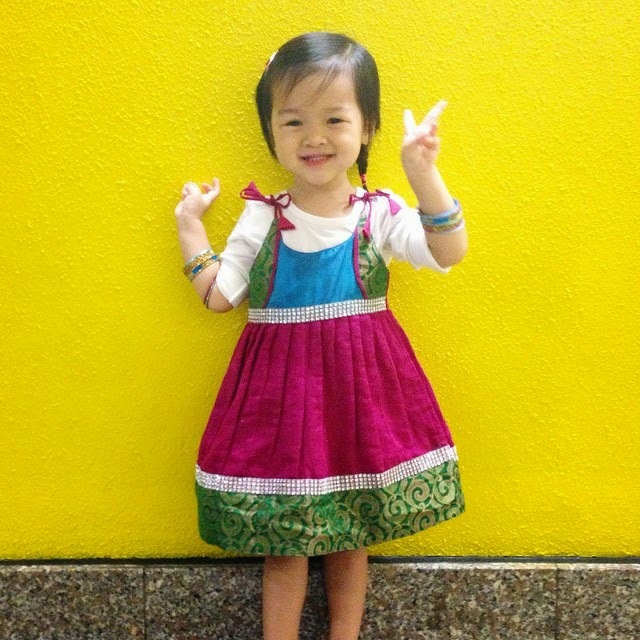 Just like last year, Kaitlin's school had a Deepavali celebration for the children. Since I didn't have time to get her a new dress, I decided to let her wear the one she wore last year. Thankfully, it still fits! 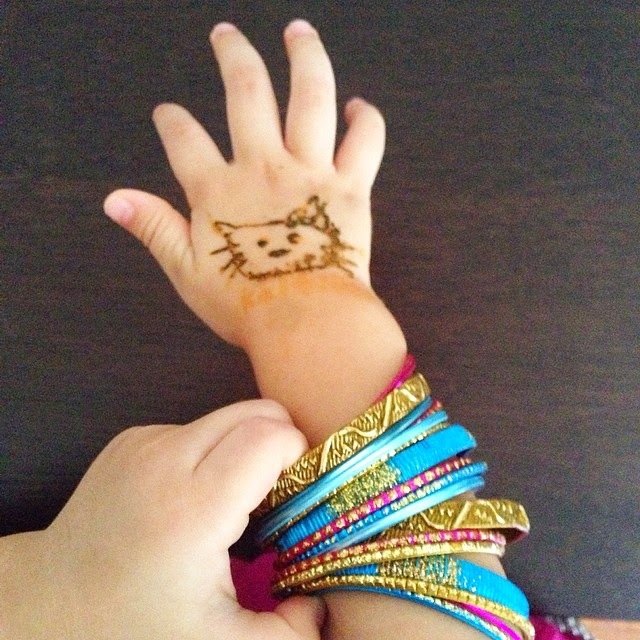 Is it not like the cutest henna ever? Hehe! 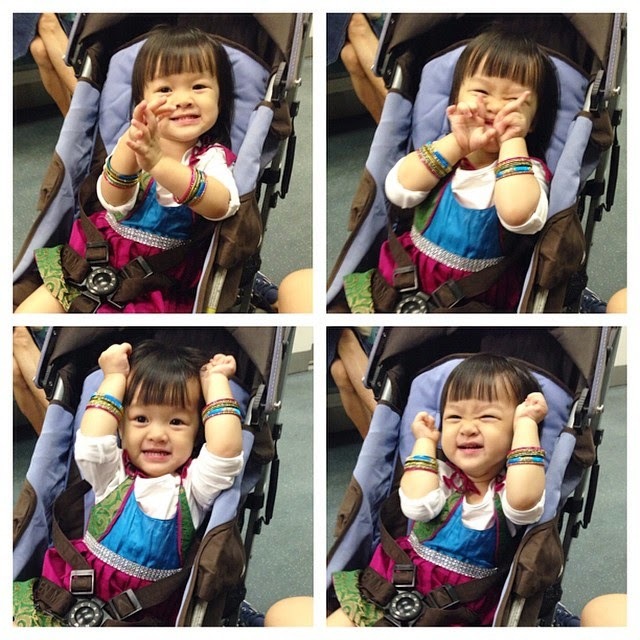 I just had to dig out the photos I took of her last Deepavali to see how much she has grown! She's still cheeky as ever, in fact more mischievous now than before. Sometimes I can hardly control her. I would have to raise my voice and use an angry tone before she actually stops whatever dangerous or unhygienic thing/action she is doing. Just look at her! She was chubbier back then. Not very chubby compared to the average kid, but comparing her back then and now..she seemed to have definitely more meat in the past, and that's one thing that always tells me how much she has grown! You know how babies have baby fats? Like those littles rolls of fats when they are like 4-6months old..yeah I missed that so much..and now I miss the small bits of chubbiness she had as a toddler. I also feel like I have a need to feed her more. Not so she will be chubby, but so she won't be so skinny! Oh sigh, how she has grown so much. Yes, she can still wear her dress and it fits her comfortably..but she has definitely grown physically and in so many other ways :') I always feel a mix of emotions, but that day, I decided to try and take things a little slower and enjoy the time we had together even more and notice the small little things. I found myself giving her more hugs and kisses than I usually do..I guess it was my way of telling her to not grow up so fast, and that even if she does grow up and eventually not need me in her life, I'll still love her all the same, and that is - so very much. I'm really glad I took those photos of Kaitlin. They are great for looking back on, and for keeping memories. But more than that, it's moments like this that remind me to not always be so caught up with doing what I/we have to do and rush through it, but also to enjoy whatever it is that the babygirl and I are doing together and to enjoy each other's company.